Swiss-born artist Boris Gratry studied Interior Design at HEAD, the Geneva School of Art and Design in Geneva; and received a Bachelor of Arts from the Institute of Interior Design and Scenography in Basel. Working in sculpture, he uses a ceramic process to transform iron into something more precious, beautiful, and elevated. Gratry has been known to brighten up corroded car parts, too, with touches of gold, creating a structure that is both rough and poetic. Whitewall spoke with the artist, who has a show later this summer in Denmark, about his practice and the role he thinks artists should play today. 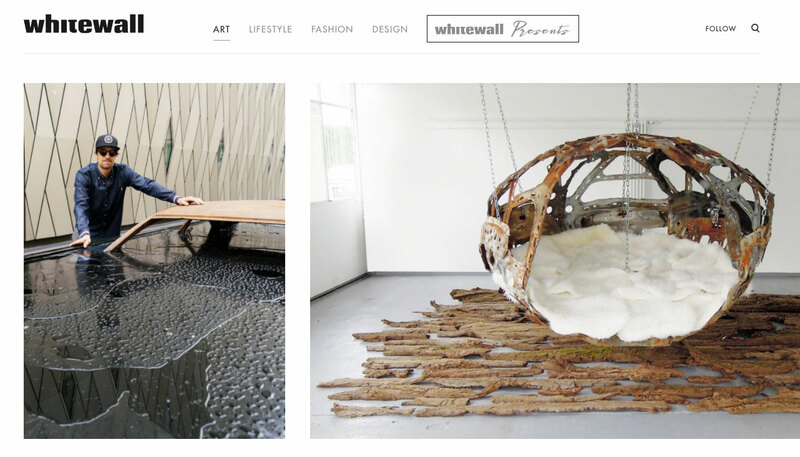 WHITEWALL: Have you always wanted to become an artist? BORIS GRATRY: I always created so I guess I managed to stay an artist. I studied architecture and scenography, which gave me the tools and knowledge to create in a more performant and coherent way. WW: How do you define the role of the artist today? BG: Being an artist is to be a reflection of your time, whether it is in the Middle Age or now. Today, the medium might have evolved but the idea is the same. Being subversive might be the key, too. WW: Who or what inspires you? BG: I’m inspired by Japanese aesthetic and handcraft like Raku ceramics, “Kenzuki” (Japanese ceramic technique which consists of putting back together a broken ceramic with gold) and the “wabizabi” principle (Japanese term for rusting) in general. I like Arte Povera artists like Giuseppe Penone. I love Richard Serra and Jean Tinguely, perhaps because they work with rusty metal. And I’m all about rusty iron! WW: How are you drawn to the materials you work with? BG: As I was already experimenting different type of metal for construction or furniture design, I was commissioned to create a metal tree for a techno festival at the Schatzalp Hotel in Davos Switzerland. I went to the scrap yard to collect rusty car parts. The sight of all these abandoned cars moved me and it took a year of digestion to realize the impact. WW: If there is one in particular, to which art movement would you be attached to? BG: We create art on planet Earth from an occidental human point of view.. If you look at the same reference point or inspiration then the answer will look similar. Arte Povera, for instance, was never a movement but more a classification made by scholars. So, being a mix of “wabizabi” and Arte Povera I can’t tell. Maybe I’m part of both and neither, all at the same time. WW: What advice would you give to an aspiring artist ? BG: It is good to have knowledge in art history and techniques, but when it comes to creation, don’t look around, focus on your art, find balance within yourself, and be stubborn. There is no right or wrong, good or bad, beautiful or ugly. All there is, is the present moment when you create. After that it’s just a residue and artefact. Embrace the present moment and create!